There are kitchen discoveries that lead to nothing but trouble. The first time I caramelized sugar, I knew I was ruined. Why would anyone want to eat drab white sugar if they could eat it cooked to a 100x as delicious toasty amber syrup? The first time I tried browned butter, I went on a butter-browning bender (cookies! breadcrumbs! crispy treats!) which, frankly, shows little sign of abating today. So, it should be no surprise that when I finally cracked the authentic pretzel-making code six months ago, I didn’t know where to stop. Everything comes up pretzel now! I’ve made pretzel scones and pretzel challahs. I’m dreaming of pretzel shortbread and popovers, pretzel bagels and grissini. I might need an intervention. But before you all gather round my canister of food-grade lye, my latex gloves and the onion goggles I really should have more shame about owning, and sit me down for a talk about where things are going, I think we need one more pretzel thing this year, and I’d like to believe I saved the best for last. Everyone should have a great recipe in their arsenal for Parker House rolls, which are easily the most perfect little dinner rolls on earth. Rich with butter and milk, tender and stretchy underneath a lightly crisp shell, they’re easy to make and hard to mess up. Warm from the oven, they are never unwelcome, and we like them as much for brunch (butter and jam or lox and cream cheese, please), weeknight dinners (tiny pulled chicken sliders) and kindergartener-sized lunchbox sandwiches, as for dinner parties. And what better time to share my favorite recipe than right on the cusp of all of the holiday entertaining ahead? I mean, I figure we’re all going to be gluten/carb/refined sugar-free by New Year’s, we might as well live it up until then. 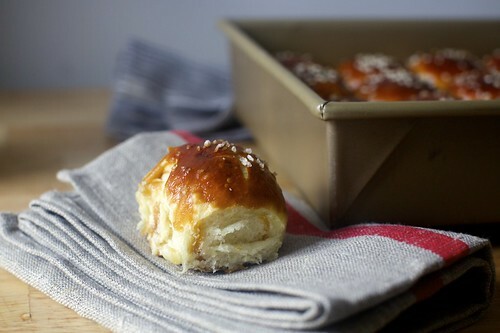 So, that was my plan: share a classic recipe for Parker House rolls. 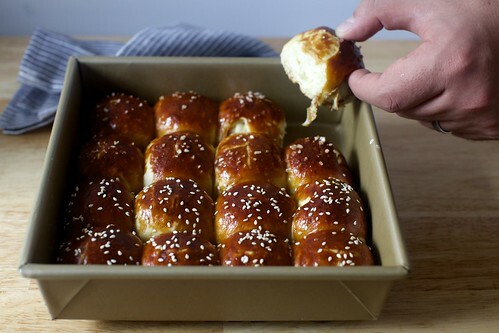 But when I saw all of those lovely humps lined up in the pan, all I could hear was the little voice in my head that whispers pretzel them to everything. And I see no reason to argue with the voices when there’s deliciousness at stake. Holiday Cooking on Pinterest: The Smitten Kitchen Pinterest page has been decked out for the holidays. Need some Pumpkin ideas? Savory or Sweet Thanksgiving ideas? Homemade Food Gifts? Or maybe just All The Cookies? We’ve got you covered. Yield: 16 small rolls. See note below about doubling. Make dough: Warm milk and sugar together until they’re about 105 to 110°F (41 to 44°C) in the bottom of a large mixing bowl. If you don’t have a thermometer, the correct temperature is when you can dip your finger into the liquid without noticing any temperature change (i.e. not warmer or cooler than your finger). Add yeast to milk-sugar mixture and let stand for 5 to 7 minutes. It should dissolve and become slightly foamy. Stir in butter, then 3/4 of flour, the salt, then remaining flour. 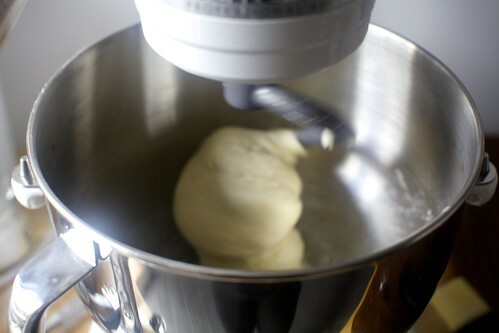 Using spoon (for manual mixing) or dough hook (of a stand mixer), mix the dough until it forms a slightly sticky dough that balls together. If making by hand, turn out onto a floured counter and knead until smooth and elastic, about 10 minutes. If using a machine, let the dough hook do the work, running it for 5 minutes on low. If, at the end of the kneading process, the dough still feels quite sticky (a little sticky is good; more tips here), add 1 more tablespoon flour. 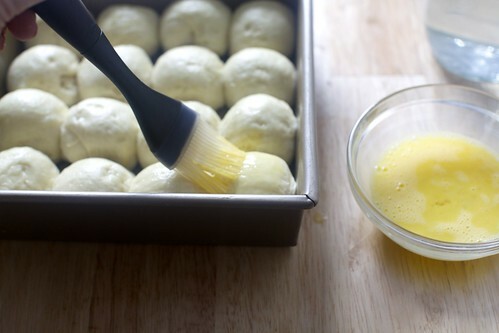 First rise: With kneaded dough on counter, butter or oil your mixing bowl. 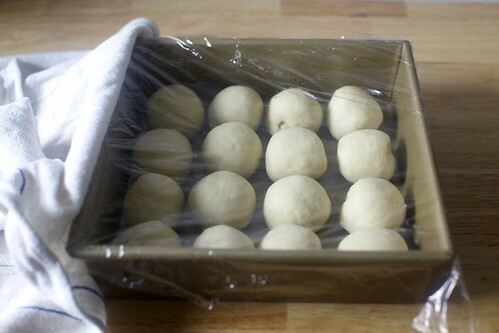 Return dough to bowl, cover with plastic wrap and place in a draft-free warmish spot for 1 hour, or until doubled in bulk. 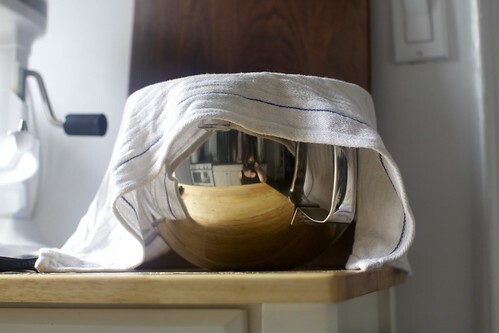 Second rise: Butter an 8×8-inch square or equivalent size baking pan (such as a 9-inch round cake pan or deep-dish pie plate). Flour your counter and let dough fall out onto it. I like to take advantage of the round shape left by the bowl to divide my dough into even-enough wedges, like slices of a pie. Divide into 16 pieces. Form each into a round. Arrange seam side-down in prepared pan, with an even amount of space between rolls. Cover loosely with plastic wrap and let rise for another hour. 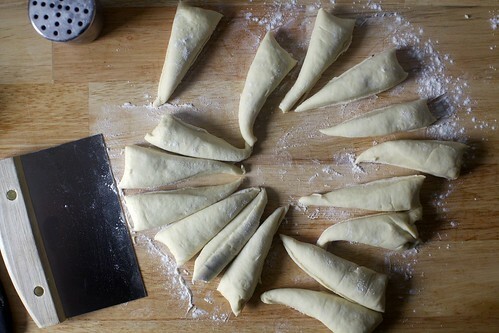 About 10 minutes before the hour is up, begin the next step to heat the oven and prep pretzel wash.
Pretzel it! Heat oven to 375°F (190°C). If using the baking soda option, bring your water to a boil and slowly stir in baking soda — it will foam up. If using the food-grade lye option, do not heat your water, just stir the lye into the water in a sink, wearing gloves (see more precautions in Notes below). Thoroughly brush tops and creases between rolls (as best as your brush can get in) with the lye or soda pretzel wash. Rinse brush and beat your egg with 1 teaspoon water. 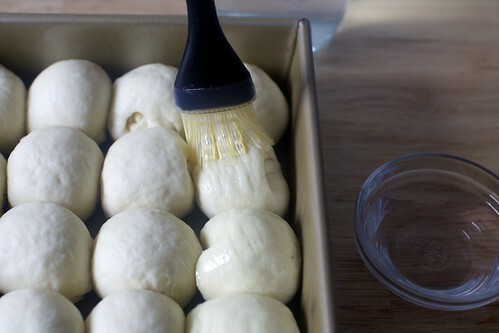 Brush the rolls a second time, this time with the egg wash. Sprinkle rolls with either sesame seeds or coarse salt. Use a sharp paring knife to make +-sign slashes in the top of each roll; you want to cut at least 1/2-inch down (I always make my cuts too shallow and they get lost when baked). 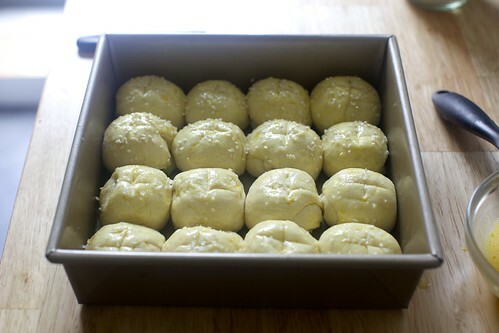 Bake: Bake rolls for 20 to 25 minutes, until a lovely brown on top. Let cool in pan on rack. Salt-topped rolls are best on the first day. 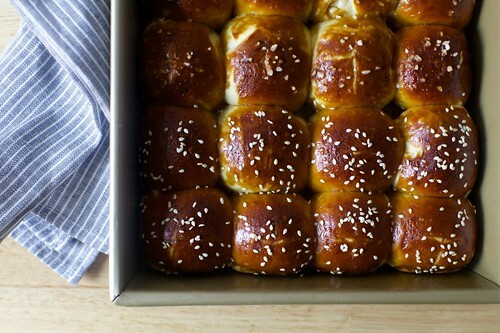 Sesame-topped rolls keep better, and can easily be frozen and stashed for future bread emergencies urgencies. Doubling this recipe: This can be doubled in a 9×13-inch pan, to yield 24 (in 4×6 rows), 28 (7×4 rows) or 35 (7×5) rows. For the 24-roll yield, allow 5 extra minutes of baking time. Soda vs. Lye Wash: I tested these a few ways. I realize that most people, people more sane than me, do not keep, or do not wish to keep, food-grade lye around to pretzel everything with, and made a batch half-brushed with the baking soda wash and half-brushed with the lye wash [see here] so you could see the difference. Yes, the baking soda wash is more pale, but you’d only know this if you were comparing it to the lye wash. The pretzel flavor is still there, which is what really matters. Glossiness: That said, I had really wanted these rolls to be glossier and in the next batch, followed the soda/lye washes with an egg wash. You can absolutely skip this if you don’t want the extra step (or don’t eat eggs), but it does add a nice sheen. Salt vs. Sesame Seeds: Finally, I sprinkled half of each batch with coarse salt and the other half with sesame seeds. It’s best to eat the salted ones right away; the salt will eventually dissolve when leftovers are wrapped, even in the freezer. Food-Grade Lye: If you’re thinking about trying out food-grade lye, here’s what you need to know: Lye is a strong akali which is highly soluble in water. Food-grade lye is FDA approved in the U.S. To use it, it’s best to wear latex gloves (though even dishwashing ones work), an apron and goggles (swim or onion goggles work too) for extra protection. Mix the lye in a glass or plastic bowl, as lye can corrode reactive metals. I do this right in the bottom of an empty sink; it’s totally safe to pour down the drain with water running, so long as you don’t have a septic system (although I couldn’t find complete agreement about whether or not septic would be an issue) — food-grade lye is a very mild drain opener! To clean up, I usually wash my gloves while still wearing them, as if washing my hands, with dish soap and rinse down the sink before removing my gloves. It sounds scary, but it’s a very simple process. I bought my bottle of lye in the Williamsburg location of Brooklyn Kitchen. You can also order it from Amazon or Modernist Pantry.